Ministry of External Affairs on Thursday, 18 February said that the government will take up the issue with Twitter for tagging Jammu and Kashmir as a part of Pakistan and People's Republic of China in location category. "I am sure this will be taken up," spokesperson of the MEA Vikas Swarup said. 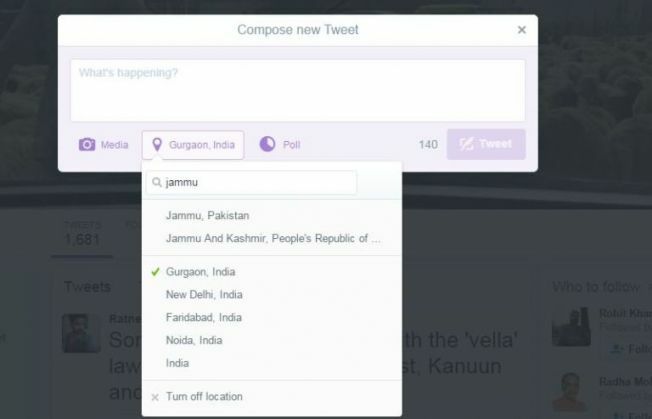 While composing any tweet, when a user types 'Jammu' in location category, the auto-suggestion dropdown shows, "Jammu, Pakistan" and "Jammu and Kashmir, People's Republic of China" back-to-back on the main page. According to a TV reports, after creating a flutter, the micro-blogging site has started fixing the problem.